In its primitive form, a wheel is a circular block of a hard and durable material at whose center has been bored a circular hole through which is placed an axle bearing about which the wheel rotates when a moment is applied by gravity or torque to the wheel about its axis, thereby making together one of the six simple machines. When placed vertically under a load-bearing platform or case, the wheel turning on the horizontal axle makes it possible to transport heavy loads; when placed horizontally, the wheel turning on its vertical axle makes it possible to control the spinning motion used to shape materials (e.g. a potter's wheel); when mounted on a column connected to a rudder or a chassis mounted on other wheels, one can control the direction of a vessel or vehicle (e.g. a ship's wheel or steering wheel); when connected to a crank, the wheel produces or transmits energy (e.g. the flywheel). The earliest well-dated depiction of a wheeled vehicle (here a wagon — four wheels, two axles) is on the 3500–3350 BCE Bronocice clay pot excavated in a Funnelbeaker culture settlement in southern Poland. In nearby Olszanica 5000 BCE 2.2 m wide door were constructed for wagon entry. This barn was 40 m long with 3 doors. In China, the wheel was certainly present with the adoption of the chariot in c. 1200 BCE, although Barbieri-Low argues for earlier Chinese wheeled vehicles, c. 2000 BCE. 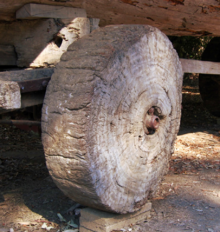 In Britain, a large wooden wheel, measuring about 1 m (3.3 ft) in diameter, was uncovered at the Must Farm site in East Anglia in 2016. The specimen, dating from 1,100–800 BCE, represents the most complete and earliest of its type found in Britain. The wheel's hub is also present. A horse's spine found nearby suggests the wheel may have been part of a horse-drawn cart. The wheel was found in a settlement built on stilts over wetland, indicating that the settlement had some sort of link to dry land. 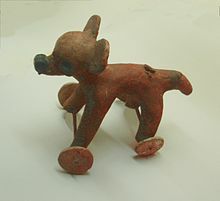 Although large-scale use of wheels did not occur in the Americas prior to European contact, numerous small wheeled artifacts, identified as children's toys, have been found in Mexican archeological sites, some dating to about 1500 BCE. It is thought that the primary obstacle to large-scale development of the wheel in the Americas was the absence of domesticated large animals which could be used to pull wheeled carriages. The closest relative of cattle present in Americas in pre-Columbian times, the American Bison, is difficult to domesticate and was never domesticated by Native Americans; several horse species existed until about 12,000 years ago, but ultimately became extinct. The only large animal that was domesticated in the Western hemisphere, the llama, a pack animal but not physically suited to use as a draft animal to pull wheeled vehicles, did not spread far beyond the Andes by the time of the arrival of Columbus. The wheel was barely used, with the exception of the Horn of Africa, in Sub-Saharan Africa well into the 19th century but this changed with the arrival of the Europeans. 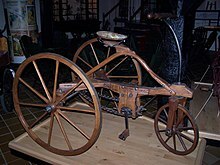 Ljubljana Marshes Wheel, from around 3150 BCE (the oldest known wooden wheel in the world). Spoked wheel with bronze sheeting from Árokalja, from around 1000 BCE. Radially- (left) and tangentially- (right) wire-spoked wheels, both with pneumatic tires. 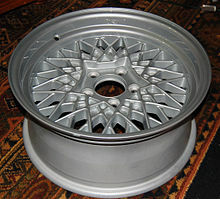 Cast alloy wheel on a folding bicycle, with a pneumatic tire. A spoked wheel on display at The National Museum of Iran, in Tehran. The wheel is dated to the late 2nd millennium BCE and was excavated at Choqa Zanbil. ^ "American Heritage Dictionary Entry: wheel". Houghton Mifflin Harcourt Publishing Company. ^ V. Gordon Childe (1928). New Light on the Most Ancient East. p. 110. ^ D.T. Potts (2012). A Companion to the Archaeology of the Ancient Near East. p. 285. ^ Moorey, Peter Roger Stuart (1999) . Ancient Mesopotamian Materials and Industries: The Archaeological Evidence. Winona Lake, IN: Eisenbrauns. p. 146. ISBN 978-1-57506-042-2. ^ Anthony, David A. (2007). The horse, the wheel, and language: how Bronze-Age riders from the Eurasian steppes shaped the modern world. Princeton, NJ: Princeton University Press. p. 67. ISBN 978-0-691-05887-0. ^ "35. Olszanica Longhouse 6: Why has it got wide doors?". 26 October 2018. ^ Velušček, A.; Čufar, K. and Zupančič, M. (2009) "Prazgodovinsko leseno kolo z osjo s kolišča Stare gmajne na Ljubljanskem barju", pp. 197–222 in A. Velušček (ed.). Koliščarska naselbina Stare gmajne in njen as. Ljubljansko barje v 2. polovici 4. tisočletja pr. Kr. Opera Instituti Archaeologici Sloveniae 16. Ljubljana. ^ Fowler, Chris; Harding, Jan and Hofmann, Daniela (eds.) (2015). The Oxford Handbook of Neolithic Europe. OUP Oxford. ISBN 0-19-166688-2. p. 109. ^ "Bronze Age wheel at 'British Pompeii' Must Farm an 'unprecedented find'". BBC. Retrieved 18 February 2016. ^ Ekholm, Gordon F (April 1946). "Wheeled Toys in Mexico". American Antiquity. 11 (4): 222–28. JSTOR 275722. ^ Diamond, Jared (1999). Guns, Germs, and Steel: The Fates of Human Societies. New York: Norton. p. 237. ISBN 978-0-393-31755-8. ^ Singer, Ben (May 2005). A brief history of the horse in America. Canadian Geographic Magazine. Archived from the original on 19 August 2014. ^ "Crafts – Uncovering Treasures of Ancient Nubia". NYTimes.com. 27 February 1994. ^ "What the Nubians Ate". Discover Magazine. ^ Fage, J.D. ; Oliver, Roland Anthony (1975). The Cambridge History of Africa. Cambridge University Press. ISBN 978-0-521-21592-3. ^ Chaves, Isaías; Engerman, Stanley L.; Robinson, James A. (2012). Reinventing the Wheel: The Economic Benefits of Wheeled Transportation in Early Colonial British West Africa (PDF). Weatherhead Center for International Affairs. p. 1. Archived from the original (PDF) on 6 January 2014. Retrieved 5 January 2014. One of the great technological puzzles of Sub-Saharan African economic history is that wheeled transportation was barely used prior to the colonial period. Instead, head porterage was the main method of transportation. ^ Law, Robin C. (1980). "Wheeled Transportation in Pre-Colonial West Africa". Africa. 50 (3): 249–62. doi:10.2307/1159117. JSTOR 1159117. ^ Ghosh, A. (1989). An Encyclopedia of Indian Archaeology. New Delhi: Munshiram Manoharlal. p. 337; Rao, L.S. (2005–06). The Harappan Spoked Wheels Rattled Down the Streets of Bhirrana, District Fatehabad, Haryana. “Puratattva” 36. pp. 59–67. ^ See e.g. Molded tablet and Bull seal, Harappa. ^ Jewel, Elizabeth (2006). The Pocket Oxford Dictionary and Thesaurus. Oxford University Press. p. 722. ISBN 978-0-19-530715-3. Retrieved 4 January 2012. ^ Hall, Adelaide S. (2005). A Glossary of Important Symbols in Their Hebrew: Pagan and Christian Forms. p. 56. ISBN 978-1-59605-593-3.